A recent study led by researchers from Stanford University showed that whole-body diffusion-weighted MRI scans could be used as a radiation-free alternative with significant effectiveness from 18F-fluorodeoxyglucose PET/CT scans to examine lymphomas and sarcomas in children and young adults. The study appeared in The Lancet Oncology (doi:10.1016/S1470-2045(14)70021-X). In the study, 22 children and young adults with lymphomas/sarcomas received either whole-body diffusion-weighted MRI scans or standard-clinical 18F-fluorodeoxyglucose PET/CT scans. The MRI scans were enhanced with ferumoxytol (Feraheme, Amag Pharmaceuticals) and were T1 weighted for anatomical orientation. 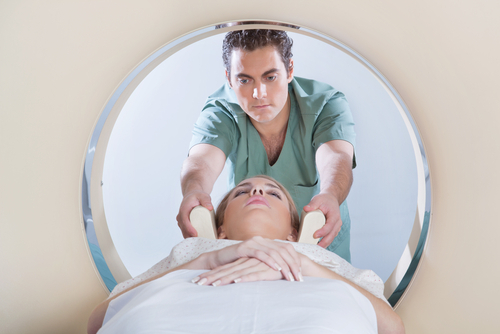 At the PET/CT scanning, patients are exposed to mean ionizing radiation of 12.5mSv. Among 1,325 anatomical regions, the MRI scans detected 158 of 174 malignant lesions and the PET/CT scans detected 163 of 174 total malignant lesions. Sensitivity of the MRI scans were 90.8% (95% CI, 85.5-94.7), whereas the PET/CT scans’ were 93.7%(95% CI, 89-96.8). The MRI scans achieved 99.5% (95% CI, 98.9-99.8) specificity vs. 97.7% (95% CI, 96.7-98.5) for the PET/CT scans. Diagnostic accuracy was 98.3% (95% CI, 97.4-99.2) for the MRI scans, whereas 97.2% (95% CI, 93.6-99.4) for the PET/CT scans. Researchers wrote that ferumoxytol was not associated with any adverse events.